Spacious home located on a corner lot in the very desirable subdivision of Rolling Hills Manor is now available. Upon entering you are greeted with hardwood floors throughout the foyer, living room, dining room, kitchen, office and half bath. New carpet has been recently installed in 3 main floor bedrooms. The entrance has an office has glass French doors and a formal dining room. The living/great room is open with a gas log fireplace and open into the kitchen. The kitchen has had a recent remodel with an updated island, granite counter top and added cabinetry. The large main floor master has an attached master bath with walk in tiled shower, separate bathtub, double vanity and walk in closet. Split floor plan has two additional main floor bedrooms with new carpet and shares a full bath. A powder room is conveniently located of the great room. The main floor is completed with a laundry room and a 12X 15 screened in porch. The upper level offers a bonus room and an additional bedroom, great storage and a full bath. A large 3 car garage is extra deep and tall. Access to the crawl space is from the garage and is extra deep. During 2018 the following improvements were made: Fresh paint, kitchen island, an additional cabinet, nest thermostats, new high quality designer blinds, new alarm, new ceiling fans and painting of the exterior hand rail and porch rail. 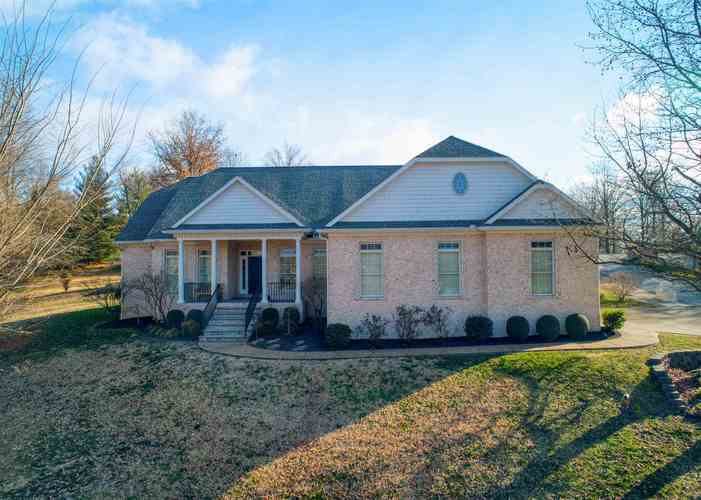 You will love what this home has to offer and you will be a short golf cart ride to Rolling Hills Country Club. Seller is offering a $520. American Home Shield warranty.